And a woman having an issue of blood twelve years, which had spent all her living upon physicians, neither could be healed of any, Came behind him, and touched the border of his garment: and immediately her issue of blood stanched. And Jesus said, Who touched me? When all denied, Peter and they that were with him said, Master, the multitude throng thee and press thee, and sayest thou, Who touched me? And Jesus said, Somebody hath touched me: for I perceive that virtue is gone out of me. She had heard about this man that opened blinded eyes, unstopped deaf ears, and even raised the dead, and she knew that he was her only hope. She had been sick for so very long, she had spent all of her money and time going from doctor to doctor with no help at all. Now she stood just a short distance away from her miracle. She knew that today was the day. She would go home tonight completely whole. She just had to find a way through the crowd. There were so many people, so many needs, so many looking for healing and hope. The crowd pressed close around him and she could only get glimpses of him as he moved through the people, touching this one and reaching out to that one. For a minute she was overwhelmed with a feeling of despair. She doubted her ability to get his attention to get close enough for him to see her and touch her. But in that minute of doubt, her faith rose up in her heart and she believed that she didn’t need him to touch her. She could touch him and still receive her miracle. And so she began to fight her way through the people. Pushing past those who hesitated. Making her way toward her healing. The closer she got to Jesus the more pressing the crowd. The harder she was having to fight to just gain an inch of ground but she was close enough now to hear his sweet voice to see his eyes filled with compassion for the hurting people around him. She was also close enough to see the wall the disciples had made of themselves to protect him for the surging crowd. And for just a moment that doubt came back again. The voice in her head told her she would never get close enough to touch him that the disciples would never let a woman like her anywhere near the Messiah. Yet, once again her faith rose up and she believed that if she could simply touch the hem of his garment she would be made whole. So she dropped to her knees and began to crawl toward her healing. I’m sure that she was stepped on and bruised but she did not let that stop her. She needed Jesus and she was going to get to him anyway that she could. I can see her crawling toward him and stretching out her hands trying with all her might for the just the tips of her finger to touch his robe. On hands and knees making her way toward Jesus and with every gain her faith and expectation growing. Just a few more inches and her years of sickness would be over. Just a little bit more and her faith would be rewarded. No one noticed her. This woman who was so desperate for God that she was crawling through dirt to simply touch the clothing he was wearing. And yet when her fingers made contact with him God himself stopped and turned to see who had touched him. Her faith arrested Heaven. Her belief in who he was and what he was capable of doing brought Jesus to a standstill and he wanted to know who had faith so great that virtue had left his body. I want to have faith like that! I want to approach the altar of my God and expect a miracle. I want to pray for the sick, the hurting, the hopeless and know that my prayers are answered! Not answered someday, not answered sometime but right now! I want to hit my knees in prayer and touch his heart in such a way that virtue flows from heaven right to where I am! I no longer want to stand on the outskirts of the crowd and hope that he will see me and come to me. I no longer want to try and push past the others who need a touch from him only to give up when the obstacles of life block my path. Today, right now, I am hitting my knees. I will crawl to him, through dirt, mud, doubt and fear. I will stretch forth my hand and strain with every fiber of my being to reach him, to touch him. For if I can but touch the hem of his garment there is no limit to what my God will do! Food, shelter, clothing, everything material that I have comes from God. My children, my husband, my family and friends all were provided from the hand of God. But he PROVIDES me with so much more than cars and houses, purses and shoes. 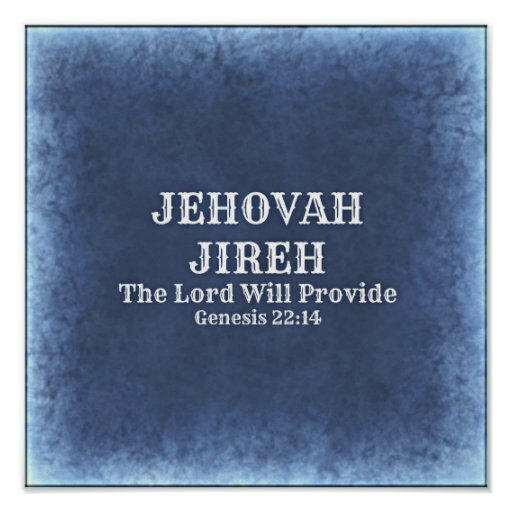 Abraham called him Jehovah Jireh because he provided a ram that saved his son's life. I call him Jehovah Jireh because he provided a lamb that saved my life!